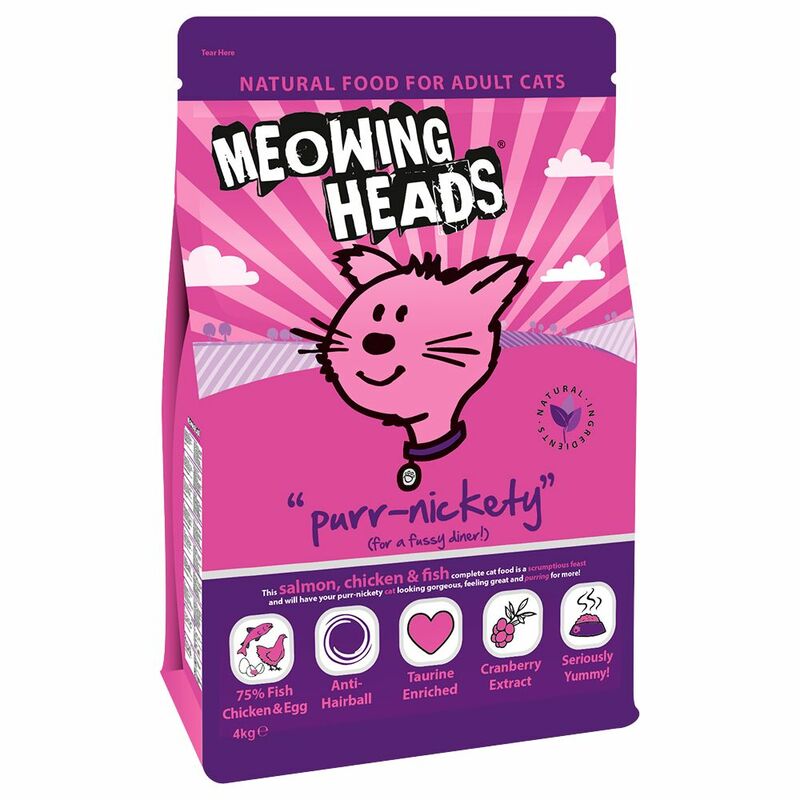 Beauty comes from within, which is why this Meowing Heads Purr-Nickety Salmon and Chicken Dry Cat Food has been specially formulated to look after your cat from the inside out! Even the fuΒiest cats won't be able to resist this delicious complete food that is not only a treat for the taste buds but beneficial for the body as well. A well-devised combination of vital nutrients ensures that you cat is happy on the inside and glowing on the outside, particularly thanks to the support of unsaturated fatty acids omega-3 and -6, and valuable zinc sulphate. These work together to keep your cat's skin radiantly healthy and fur gleaming and gloΒy. This protein-rich meal is completed with 75% premium quality succulent salmon, tender chicken and wholesome egg, all of which are scrumptious and bound to win over even the most critical of cats. This 100% natural recipe is complete and balanced, using exclusively the finest quality ingredients and avoiding artificial additives. This ensures the highest poΒible vitamin and mineral content in this Meowing Heads Purr-Nickety Salmon and Chicken Dry Cat Food, alongside plant extracts with specific health benefits for your cat. These include taurine, which is key for heart health, cranberry extract for the urinary tract, and additional vegetable fibres to help prevent the build up of nasty hairballs. All of these ingredients are combined in colourful, modern packaging to give you the recipe for a happy cat! Meowing Heads Purr-Nickety Salmon and Chicken at a glance: A complete balanced dry food for adult cats With a special recipe designed to please even the pickiest of cats 100% natural: high-quality selected ingredients that are free from artificial colours, flavours and preservatives Contains 75% premium salmon, chicken and egg to ensure this recipe is protein-rich and full of flavour With taurine to keep your cat's heart and eyesight strong Contains cranberry extract: a rich source of antioxidants and vital for urinary tract health A source of omega-3, omega-6 and zinc: these support radiant skin and sleek fur Anti-hairball recipe: with additional vegetable fibres to help keep stray hairs moving through the digestive system The optimum balance of ingredients: with a combination of valuable vegetables, grains and plant extracts for vitamins, minerals and trace elements With seaweed: a natural source of quality calcium for strong teeth and bones Extremely well accepted: a particularly delectable recipe designed to tempt your cat with natural, premium ingredients Made in UK by premium pet food producer Barking Heads. Price just £45.99! Click here to buy now!